How do I build event-based flows? You can quickly connect multiple backend systems and platforms to build integrations that detect and react to new or recurring events. Native support for event-based apps is augmented with polling for unsupported systems, ensuring you can use all the data available. How are events tracked in real time? Providing access to data ensures that teams with the context to apply it can react quickly to new events. Where this data exists in complex backend systems, teams who manage them can provide controlled access to specific information for their colleagues, using a browser-based tooling experience. How do event notifications work? Our situation detection technology proactively determines business events of importance. It provides context-driven notifications that alert you at the right time, prompting you to choose the right action from a set of pre-configurable options. How do I connect applications and data? You can connect to any application or endpoint, from the latest SaaS apps to mainframe systems. Pre-packaged smart connectors for ERP, CRM, HR and other applications enable rapid connectivity, while technology connectors provide extensive support for a range of data protocols and formats. A model-driven, code-free approach lets you implement the operations of your API as an integration flow. More technical users can further extend these patterns with a full range of advanced features. In either case, users do not need to become experts on the backend systems. How do I expose APIs that are ready for development? When you’re done building your flow, the API is ready for use by development teams and for developer communities. The API is run within App Connect, but you can choose to manage it through another API management solution. This is done seamlessly through a one-click publish to API Connect. Can I connect any endpoint? Yes. Pre-packaged connectors to cloud and on-premise apps enable fast and secure connectivity. This unlocks the data and ensures all information is accurate and available to use. Direct access to your apps also allows you to work with custom fields where your business has extended standard models. Intelligent mapping functions enable you to transform and cleanse data, as it moves between apps, and align it directly to its destination. This ensures that the information is immediately available and ready to use. Can you support my specific integration needs? 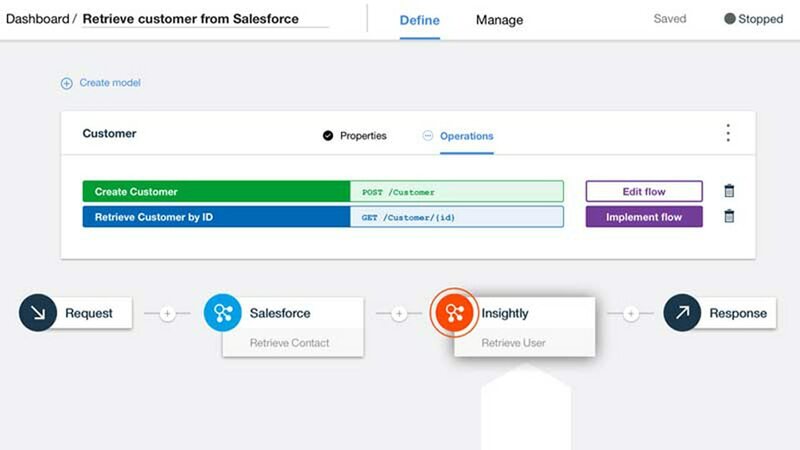 App Connect supports batch, bulk and real-time synchronization, providing flexibility to deliver information when you need it. These capabilities can move at the speed of your business due to the scalable runtime.